SEMA (Specialty Equipment Market Association) was founded in 1963 by a small group of manufacturers producing automotive performance parts. This association was formed to set standards, promote the industry and develop programs that would support aftermarket products. The organization has expanded to include additional interests of its members – government legislation, foreign trade, education, market research, etc. And, the membership has grown to comprise all aspects of the business which now includes retailers, warehouse distributors and publishing companies. To bring the stakeholders from the performance aftermarket together the first trade show was organized in 1967. The event was held in Los Angeles – it attracted just under 100-manufacturers and approximately 3,000 attendees. In 1977, the SEMA Show moved to Las Vegas which was better equipped to handle the growing requirements of manufacturers and attendees. Today, the show, at the Las Vegas Convention Center, boasts over 2,300 exhibitors and in excess of 150,000 people with ties to the automotive performance aftermarket. Visitors can see the hottest automotive products and attend demonstrations, educational seminars and special events. Below, are images from the 1997 show. 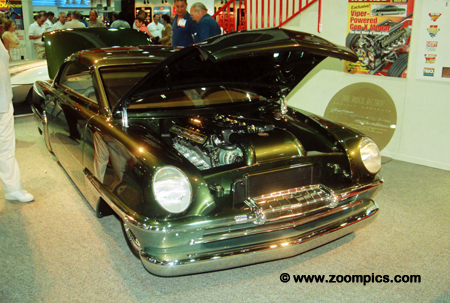 One of the highlights of the 1997 SEMA show was the unveiling of this custom 1954 Plymouth Belvedere. This car was designed by Chip Foose and built by Troy Trepanier. Called the Sniper it was powered by a 1997 V12 Viper engine. The build was in recognition of Hot Rod magazine’s 50th anniversary. 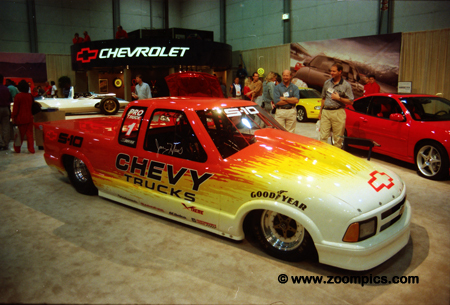 In 1997, the National Hot Rod Association (NHRA) proposed a new class called Pro Stock Truck. Chevrolet had an S-10 Pickup on display which was prepared for the 1998 season. It seemed inevitable that NHRA would introduce this class as truck sales were high and NASCAR was having a great deal of success with their truck series. General Motors brought one of their older concept cars to the show. 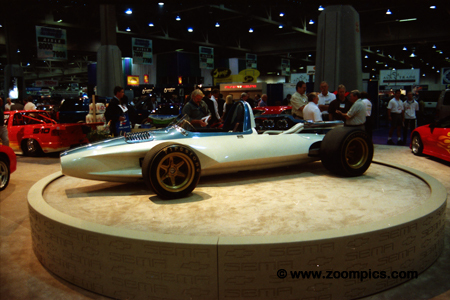 The CERV I was championed by Zora Arkus Duntov with design support from Larry Shinoda and Tony Lapine. Duntov hoped the car would compete at Indy but an Automobile Manufacturer’s Association ban on car makers involvement in racing prevented the CERV I from seeing competition. When tested the car reached a top speed of 206-mph. 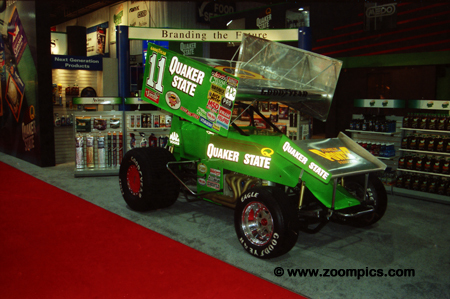 The World of Outlaws (WoO) Sprint Car of Steve Kinser appeared in the Quaker State booth. Kinser has won twenty WoO Championships – winning his first in 1978. He has also competed in NASCAR and the Indy Racing League. Kinser entered the 1997 Indianapolis 500 and finished fourteenth. This is a Saleen S-281. 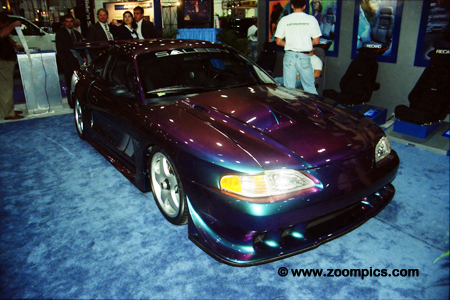 Saleen, an American manufacturer of specialty high-performance cars, introduced the S-281 in 1995. These modified Ford Mustangs were based on the 4.6L GT model and were powered by a naturally aspirated 4.6-liter SOHC V8 engine. The Saleen update also included a suspension upgrade and a body kit. One of many race cars in the Ford area was the No. 88 Ford Taurus. 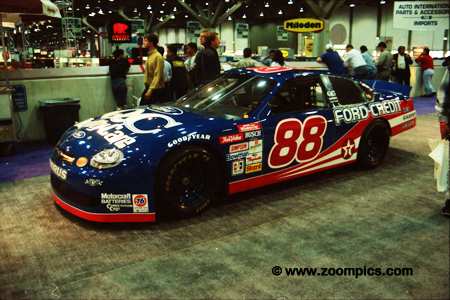 This car was driven by Dale Jarrett during the 1997 NASCAR season. Jarrett was part of a two car Robert Yates team which included Ernie Irvin. Jarrett finished second to GM driver Jeff Gordon in the final Driver’s Championship standings. 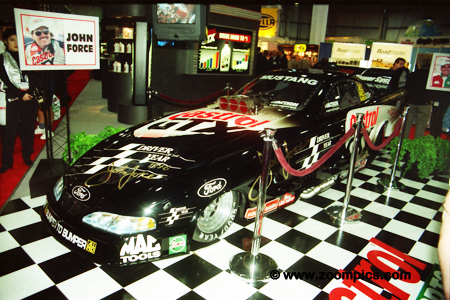 Another race car at the 1997 show, in the First Brands booth, was the No. 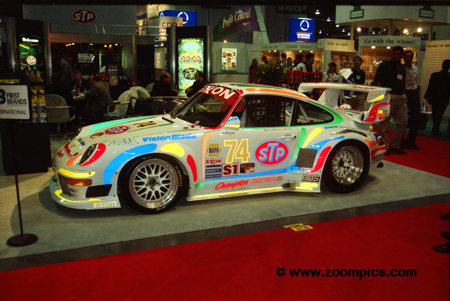 74 Champion Racing Porsche 911 GT2. This car competed in the IMSA GTS-1 class and was raced at the 24-Hours of Daytona and 12-Hours of Sebring. The team’s regular drivers were sports car veterans Hans Stuck and Bill Adam. Their best finish was a class victory in the 1996 12-Hours of Sebring. 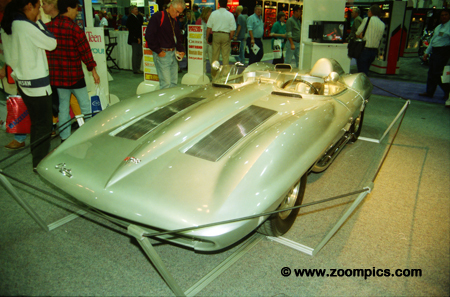 General Motors also brought the 1959 Corvette Sting Ray concept car to the show. This car was designed by, GMs Vice President of Styling, Bill Mitchell and Larry Shinoda. This Sting Ray was built with the intention of competing at Le Mans. But it suffered the same fate as the CERV I project. A ban by the Automobile Manufacturer’s Association prevented this plan from becoming a reality. The Minivan market received a huge push when Chrysler introduced the Dodge Caravan and Plymouth Voyager models in 1984. These vehicles reduced the demand for station wagons and forced Chrysler’s competitors to produce similar offerings. General Motors responded by building the GMC Safari and Chevrolet Astro. It did not take long for the aftermarket to produce products for Minivans. Each year it seems that aftermarket performance companies focus on modifying a certain make and model. Not only were Minivans a popular choice but Dodge’s Ram Pickup received a lot of attention. A number of Dodge Ram Pickups appeared at the show with vendors showcasing their body kits and performance upgrades. 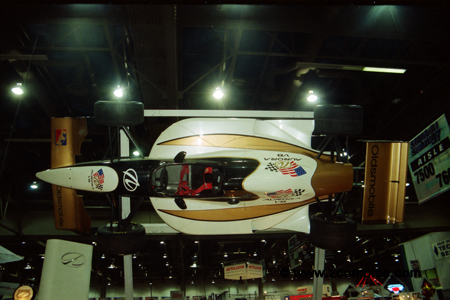 A Dallara chassis from the 1997 Indy Racing League (IRL) season hangs above the Oldsmobile display. A change in the IRL engine rules included a switch to normally aspirated 4-liter, 32-valve production based engines. One of the manufacturers supplying engines to the series was Oldsmobile. Some competitors chose to compete with the Oldsmobile Aurora (L47) engine. The Castrol Booth included John Force’s championship winning Ford Mustang Funny Car. 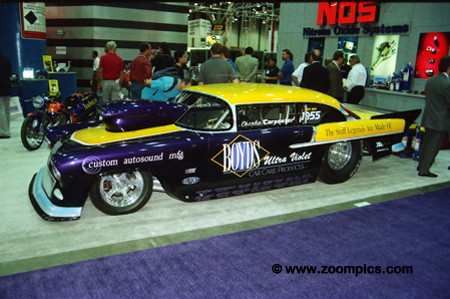 Force was on a roll in 1997 - he had won the National Hot Rod Association Funny Car championship from 1990 to 1997. The previous year, Force was the first drag racer named ‘Driver of the Year’ by a panel of automobile and motorsports journalists. 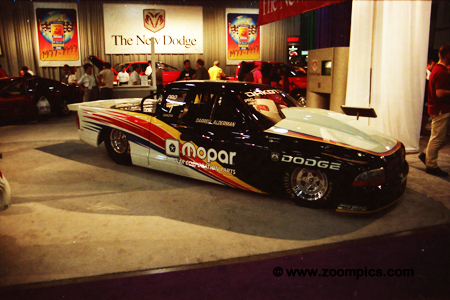 Dodge also had a pickup on display to compete in the NHRA’s new Pro Stock Truck program. Compared to the Pro Stock class for cars the trucks were 50-lbs. lighter, had a smaller motor (350 versus 500-cubic inches) and a longer wheelbase. 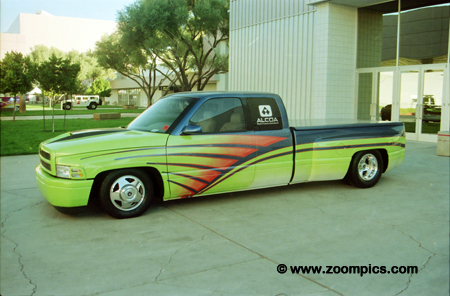 The truck on display is a Dodge Dakota driven by drag racing veteran – Darrell Alderman. On display in the Goodyear booth was Walker Racing’s Reynard 97i. 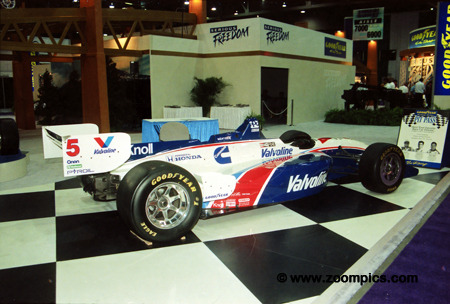 This Honda-powered car was driven by Gil de Ferran during the 1997 Championship Auto Racing Teams (CART) season. De Ferran did not win any CART races in 1997 but started from the pole at Long Beach and Detroit and finished second in the final standings. 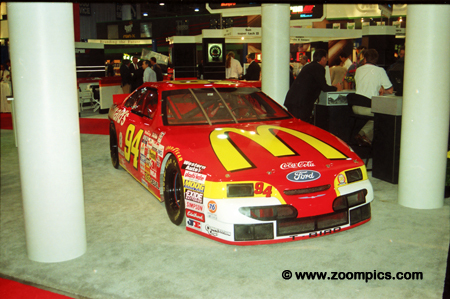 In 1997, Bill Elliott raced this Ford Thunderbird in NASCAR’s Winston Cup series. Highlights in Elliott’s career included – 1988 Winston Cup Champion, winner of the 2002 Brickyard 400 and victories in the 1985 and 1987 Daytona 500. He was also voted NASCAR’s ‘Most Popular Driver’ sixteen-times. At the end of the 1997 season, he finished eighth in points. One of the many vehicles on display outside the convention center was Larry Ragland’s Chevrolet Pickup. 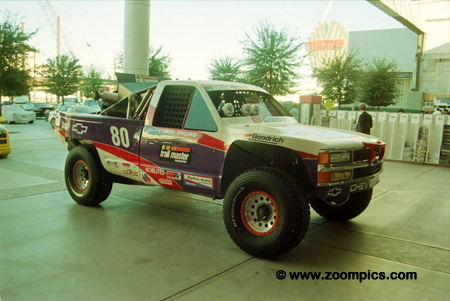 In 1997, this off-road racing Trophy Truck won the SCORE Baja 1000 and earned Ragland the Pikes Peak ‘Rookie of the Year’ award. 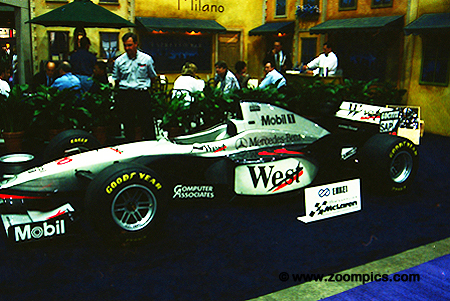 The ENKEI Wheels booth featured David Coulthard’s 1997 McLaren-Mercedes MP4/12. Coulthard suffered through a series of retirements but won the Australian and Italian Grand Prix and finished third in the final Driver’s Championship. ENKEI has always been an international leader in the custom aftermarket wheel business – supplying products for street and racing applications.